« Swingin’ in the Rain ! 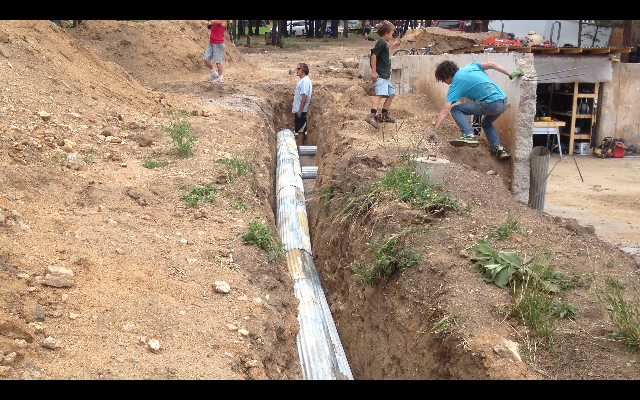 We’ve just they french-drain & vent/cooling tubes. These tubes bring geo-thermally cooled fresh air to the back of the house. The tubes run underground so the incoming air is cooled to about 55 degrees. In the summer this is A/C in the winter it is significantly warmer than the outside air. The concept utilizes the geo-stable temperature of the ground below frost line. 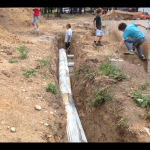 The insulation is inside the pipe – but the pipe is buried under 3-5 feet of earth well below frost line.